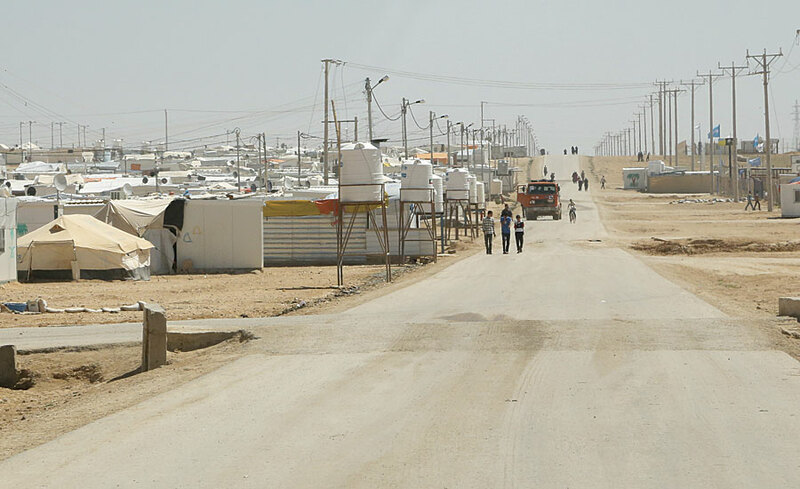 As of September 2015, more than 620,000 Syrian refugees had fled to Jordan—to refugee camps such as Zaatari, pictured here—since the Syrian civil war began. Since the Syrian civil war began in March 2011, more than four million Syrian refugees have fled their country, with more than 620,000 seeking safety in neighboring Jordan, according to the United Nations High Commissioner for Refugees as of September 2015. Many—especially the estimated 20 percent housed in refugee camps—lack access to basic necessities, such as clean water, food, and shelter. Living in extreme and uncertain conditions often precipitates health problems. Even seemingly benign cuts, scrapes, skin cracks, and burns can lead to more serious complications when left untreated. That is why Direct Relief embarked on a mission in April 2015 to treat and document skin conditions among Syrian refugees in Jordan. Working with Esri’s Survey123 for ArcGIS app, Direct Relief was able to rapidly diagnose, treat, and collect medical records on more than 1,000 refugees—in just six days. The two teams sent on the mission to the Zaatari refugee camp in northern Jordan each consisted of a dermatologist, a translator, and a scribe. Each team was set up with its own tent, table, and basic medical supplies. Early every morning, a line of people would form and extend past the camp’s borders. When there was enough light, the Direct Relief teams began working as swiftly as possible to examine, diagnose, and prescribe treatments for as many people as they could before daylight ran out. Each team spent about three minutes with a patient from start to finish. The doctor first examined the patient and made a verbal assessment of symptoms and diagnosis. The doctor then told the translator the patient’s condition and the recommended treatment, and the translator relayed the information to the patient. Throughout this process, the scribe used an Android tablet to record everything in Survey123. This created a medical record for the patient on the spot, complete with information about who they were, where they were from, what symptoms they had, and any recommended treatments. Survey123 is a data collection app designed to meet the unique challenges its users face in demanding field situations. Surveys can be prepared ahead of time, completed offline, uploaded to ArcGIS Online to analyze patterns, and shared with an array of interested partners. With Survey123 for ArcGIS, surveys can be prepared ahead of time, completed offline, and then uploaded to ArcGIS Online. To create the survey it used in Jordan, Direct Relief first downloaded Survey123 Connect. The program uses as its foundation the XLSForm specification—a standard format that makes it easy to set up form-based data collection. Once the GIS practitioners finished building the survey, they saved it to the Survey123 website under My Surveys so teams could access it whenever they needed. From there, users could retrieve the survey on their Android tablets via the Survey123 app, downloaded from the Google Play store. With the app open, the field teams could see all the surveys that had been shared with that account and download them directly to the device for offline use later. The scribes accessed the survey each day at the refugee camps. Using the Android tablets, they input data quickly into a preset form (using multiple languages when needed), embedded audio and images, and even included advanced logic and branching when respondents’ answers led them down various paths of questioning. “We want doctors in the field to take and rapidly add photos to a medical record, even when working offline, so we know exactly what kinds of conditions were seen,” said Schroeder. All the capabilities of Survey123 helped scribes keep up with the doctors’ rapid-fire pace, which is what enabled the teams to see so many people with such limited time. Not only that, but after the six-day mission, Direct Relief was able to share the survey data with local partners so they could conduct follow-ups with patients. This was made possible by having the scribes save each survey directly to their Android tablets and then, once they had Internet access, upload the surveys to ArcGIS Online, where Direct Relief could do analysis and share the datasets with others. 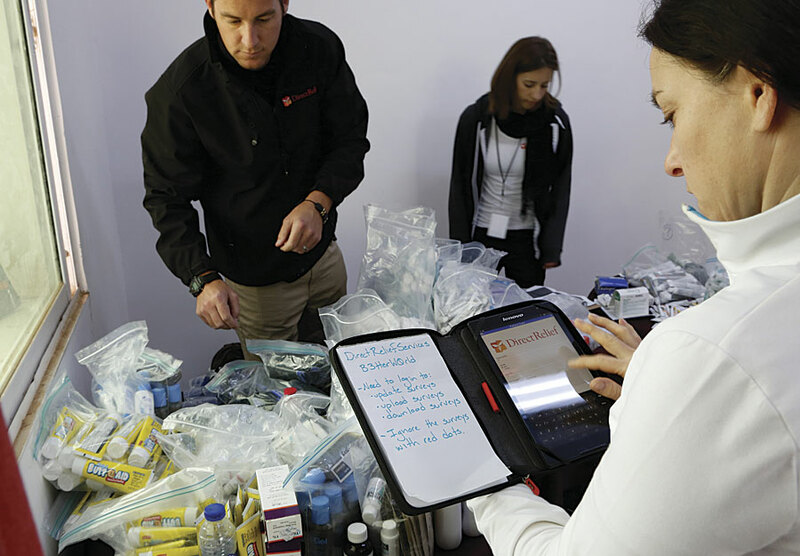 To provide emergency medical assistance, Direct Relief relies on material and financial contributions from medical equipment manufacturers, pharmaceutical companies, and private donors. As such, it is imperative that the organization allocate its resources based on reliable data. “The mission to Jordan yielded practical outcomes, but it was also kind of an experiment for us,” said Schroeder. Besides treating patients, the organization wanted to answer some ancillary questions as well: “What range of conditions showed up? How do we refine our mix of medical supplies in the future? How do we work with local organizations to be more effective? The data we collected will help us make better decisions for the next mission,” said Schroeder. Direct Relief is now looking to use the data collected with Survey123 to build web applications and story maps, leveraging ArcGIS Online to share the results of its work even more widely so that additional organizations can use it to plan other, longer-term relief efforts. “In the future, we foresee that tools like Survey123 for ArcGIS will be incredibly useful for disaster response situations—or anything time sensitive that requires us to collect and share data extremely quickly from offline environments,” said Schroeder. Direct Relief was awarded a Special Achievement in GIS (SAG) Award at the 2015 Esri User Conference for its work developing map applications for the One-Million Community Health Workers campaign.